The holidays are a time when we decorate our houses, cook delicious meals, and spend time with friends and family. But with all of the decorations and cooking, your house is at an increased risk for a fire. For example, when you are distracted by guests and neglecting the stove, a cooking fire is more likely to occur. Take a look at these holiday fire safety tips to reduce accidents this season. From 2012 to 2016, firefighters responded to about 170 house fires from holiday trees on average each year. A dry tree is perfect kindling for a fire, so be sure to keep your tree watered. Also, keep your tree away from any source of heat, like a fireplace or space heater. Before stringing lights on the tree, inspect the lights for areas where the wire insulation has worn away and for any broken bulbs. Especially when you have company over, it’s easy to get distracted and forget that you have something on the stove. One of the holiday fire safety tips that you can use to reduce the risk of a cooking-related fire is to carry a timer with you and set it to go off in a few minutes. When you’re visiting with friends and family that you might not have seen for the entire year, and a timer will remind you to pay attention to the open flame on the stove. 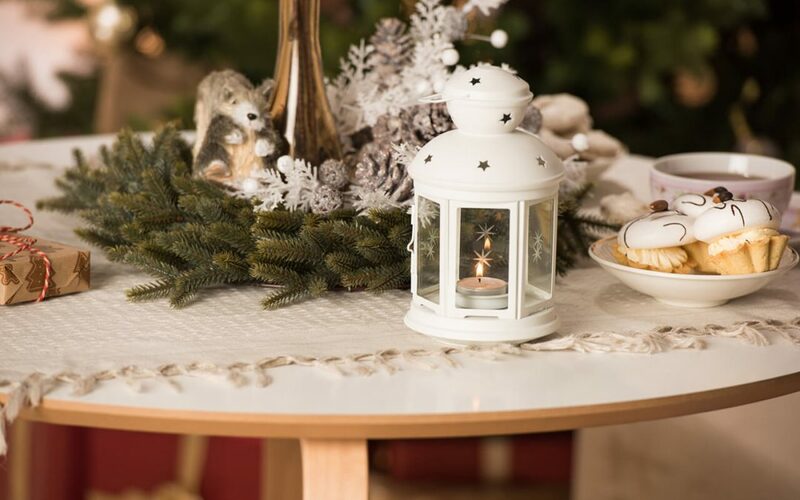 Candles during the holidays put an extra special touch on your decorations. But candle fires are more common in December when the holidays are in full swing. If you choose to burn candles, opt for a jar candle or a candle holder or lantern that has walls instead of a pillar or taper candle. Minature wreaths around the base of candles are popular decorations but are unsafe because they can catch on fire. If you have lit candles, walk through all of the rooms and check to make sure that the flames are extinguished before leaving the house or going to bed. You might not always have matches in the house, so when you have a box around the holiday season, your children can get curious. One holiday fire safety tip is to keep the matches away from the kids by putting them in a high cupboard so that kids can’t reach them. You may think that younger children don’t have the dexterity to strike a match, but you’d be surprised. Wooden matches are especially easy to strike. The risk of a house fire increases around the holidays. Getting distracted or making a poor decorating decision can result in a devastating fire. Take a few extra minutes to use holiday fire safety tips this season. Encompass Home Inspection Service wishes you a safe and happy holiday season.